1. Choose Add Google Drive and login with the Google Drive account you want to use with Insync. 2. Enter your Google Drive account. You can close this login tab/window and go to the Insync app window to continue the installation process. 4. After choosing your Insync folder location, you have the option to sync your files by checking the boxes beside each file or just choose Skip syncing for now. 1. Click on your Google Drive account (headshot with Google Drive icon) on the top bar. Go to My Drive on the left-hand panel. 3. 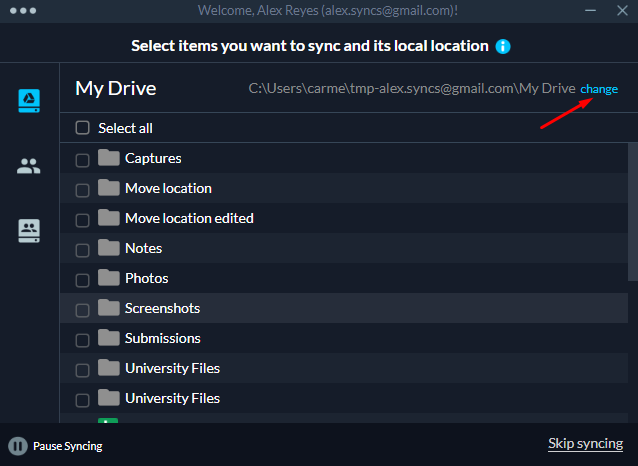 To sync all of the files inside your My Drive, click Select all found above the first row of files, and click Sync. Are you happy with Insync? Purchase your license here and enter the Google Drive account you want to sync with Insync.